Right around this time last year I commented on the burgeoning European market for new, yes, new, Type 2 Volkswagen "Bay Window" Buses fresh off the factory line in Brazil. Brazil was the last place on earth where this endangered Kombi species continued to reproduce, and thanks to an entrepreneurial Dutch VW distributor, it briefly looked as if these majestic beasts would reestablish a healthy population in their natural European habitat. So it was with much sadness that I recently learned of their imminent extinction. New safety regulations in Brazil mandate that cars built after January 1, 2014, must have anti-lock brakes and driver and front-passenger airbags. Redesigning the Kombi to meet the new standards would necessitate an entire ground-up redesign, something unfeasible and unnecessary when VW has numerous more modern replacements in its lineup to take the place of its classic van. Unfeasible? Perhaps. Unnecessary? That's open to debate. 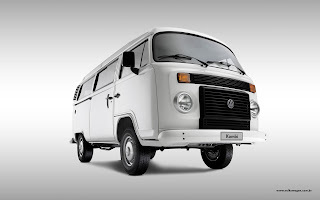 I don't think any modern vehicle will ever replace the classic Kombis that have crisscrossed the Earth for 63 years, carrying generation upon generation of loving VW enthusiasts. The last of these beautiful buses will be produced in December 2013 at VW’s Anchieta factory in Brazil. Tchau, Kombi. You will be missed. The finale of Jerry Seinfeld's web series "Comedians in Cars Getting Coffee" opens with the turn of a key and roar of an engine. The camera quickly cuts to an unmistakeable vehicle bumper and then flashes—just for an instant—to the spinning V-belt belt of an antique engine, and finally, we're confronted with an extreme close-up of the iconic (and iconically rusted) VW emblem. If there was any doubt about the identity of this mysterious monster, a voice-over from Jerry informs us that we're seeing “a 1962 VW split-window double-cab bus in dove blue, primer gray, and rust. The interior,” Seinfeld continues, “is gray vinyl and duct tape.” He goes on to reveal some interesting details about this particular vehicle and its unique history. Each episode, Seinfeld picks his guest up in an automobile that he somehow likens to the guest's personality. That's the premise of the show. When Jerry picks up his old Seinfeld buddy, Michael Richards (aka Kramer), he says "This is you, Michael," a metaphor, I wonder, for an old, nearly broken down thing of the past? Much of the episode is filmed on the road, with Jerry and Richards reminiscing about the good ol' days. I found the '62 Bus to be more compelling than most of the episode itself, except for the emotional moment in the coffee shop when Richards recalls the infamous incident seven years ago when he responded to typical comedy club heckling with a long rant of racial slurs.